Ayurveda does not treat hay fever symptomatically the anti histamine route. An Ayurvedic practitioner classifies the type of allergic reaction based on your body profile and type of symptoms. They use your knowledge on your ayurvedic body type and peculiarity of your symptoms to provide you with a tailored treatment plan to build your immunity towards allergens for this season and many more seasons to come. If you want to build your resistance to hay fever or any allergy for that matter, speak to your Ayurvedic practitioner. You may also want to consider if you have any options to prevent hay fever than trying to treat hay fever. It is spring once again. Everyone agrees it is the most glorious time of the year, with everything in nature fresh and beautiful. The winter woollies are ready to be put away for a while. However, ask the ones who reach for their nasal sprays and hay fever relief medication as soon as the season turns. A lot of the beauty is lost in the after-effects of hay fever. Ayurveda, in its ancient wisdom, has provided for therapies and remedies that can help contain and manage hay fever. It uses your own body, and its ability to work with natural treatments to help heal. Hay fever treatment in Ayurveda is based on an individual’s body type or dosha type. While natural and home remedies are useful in managing hay fever, it is better to consult an ayurvedic practitioner for a naturopathic holistic and longer-term cure. A practitioner will first identify your base dosha make up. Then they would identify the specific type of dosha that is causing the hay fever flare up. They would use this diagnosis to create a customised treatment plan. Combine the initial treatment, life style changes and changes to your diet for a long term cure. We have for you, information that will help not only in understanding the malady better; but show you exactly how Ayurveda works on this sometimes chronic ailment. At Ayurwoman, our practitioner Jyothi will walk you through all of it herself. Join us in this journey of knowledge and healing! 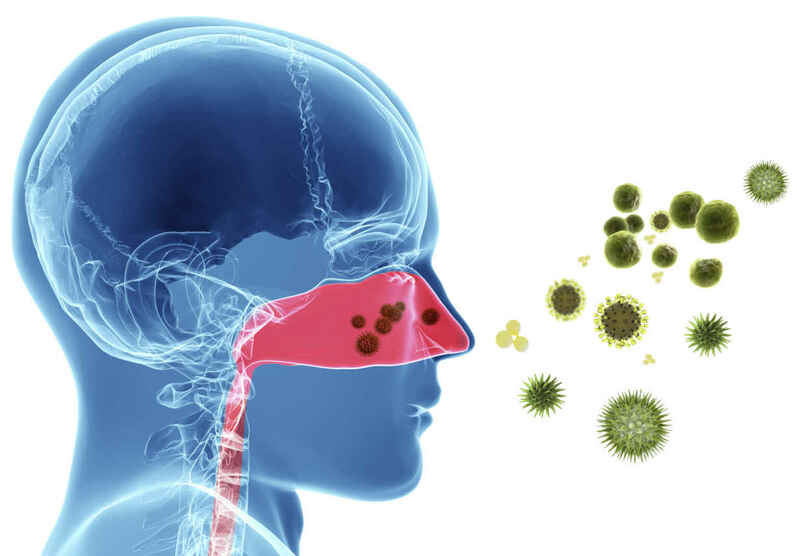 Hay fever or allergic rhinitis is allergic reactions that occur in eye and nose. It is essentially an allergic reaction on nasal airways mainly caused by allergen grass pollen. It has nothing to do with allergy and hay nor is it a fever. Common allergens are dust mite, pollen, moulds, dog and cat hair, insect stings, some drugs and foods such as eggs, wheat, peanuts, and fish. A healthy system copes with allergens, but if it is stressed or strained or if there is an infection or if the person is fatigued then the arrival of allergen tips the balance and an allergic response (or allergic reaction) occurs. This might take shape and form of hay fever, skin rashes or gastric upsets. Scattered throughout the tissues lining the surface of the body, skin, nose, eye, lips, mouth, lungs and intestine are millions of single cells called mast cells which are responsible for producing a chemical called histamine when an allergen (antigen) penetrates the body. These histamines trigger the allergic reactions in the form of itching. The human body, comprising many sensitive areas is prone to be affected by the smallest changes in the physiology. Allergic reaction on Skin, eye, and nose are the most commonly observed ones. The release of histamine into the skin produces irritation and itching. Due to excess histamines in the blood, blood plasma leaks out of the blood and is trapped beneath the skin and produces white bumps called hives. Allergic reactions in the eye cause irritation and itchiness. Eyes may become red and watery and membrane becomes swollen. Tears run into the nasal passage and cause stuffiness and snuffles. Allergic reaction in the nose brings immediate reaction which causes continual sneezing and headache. Ayurveda has, in its ancient texts clearly outlined its view on allergic rhinitis. We share with you some of its wisdom. For a first-hand experience of this wisdom being put into practice, please do contact us or visit our wellness center in Melbourne. Ayurveda believes a person with a weak digestive system (weak digestive fire) has toxins in their body and ayurvedic hay fever remedies revolve around this principle. During winter months more fat or kapha forms an extra insulator layer which increases body’s core temperature. Towards the end of the winter season, rising ambient temperature melts this extra mucous layer which slowly moves into the bloodstream. In an ideal state, bodily systems either neutralise or excrete such toxins. Those individuals whose body lacks or is deficient in this neutralisation and secretion capacity, are seen as more prone to get allergic reactions and hay fever. This mucous or kapha is in some ways responsible for weakening the digestive fire or digestive agni. Vata is responsible for changes and movements in the body. Seasonal changes in nature trigger the Vata humor. Another aspect is the nervous system. Our nervous system is the main seat of Vata dosha. An aggravated or overstimulated Vata dosha ( and its main seat of nervous system ) triggers continula sneezing and headache. Since all of us differ in basic physiology, hay fever symptoms can also vary from person to person. Ayurveda differentiates symptoms according to these distinctly varying body types. Ayurwoman recommends an ayurvedic diet, herbal formulations and hay fever remedies are customised for each person or each situation. A person with vitiated vata dosha is more susceptible to sneezing, headache, insomnia, dryness of mouth and throat and generalised aches and pains. A vitiated pitha dosha situation would get more pitha vitiated symptoms such as burning and watery eyes, hives, throat pain and inflammation, feeling feverish and occasional gastric upsets. Kapha vitiated allergy is more prone to get a runny nose, nasal block, sinus infection, itchiness, heaviness and lethargy. Since symptoms vary according to the dosha involved, hay fever remedies also have to be customised. Ayurveda allows for safe and natural means of treating this malady. We share with you Ayurvedic Preparations for hay fever. While there are numerous classical ayurvedic preparations, one should consult an ayurvedic practitioner for the right diagnosis and treatment. Nasya medicines or nasal drops are very beneficial in rhinitis. Daily application of anuthailam protects the nasal mucosa from further antigen attack and is thus a preventative medicine for hay fever. Virechana or purgation therapy is a cleansing process and removes toxins from the intestine. Virechana is considered a supportive therapy in the treatment of hay fever. An ayurvedic diet supports hay fever herbal treatments. Inability to follow a strict dietary regime can create a dosha imbalance. An incompatible diet is also likely to reduce the effectiveness of main line treatments. Digestion correcting herbs like cumin, coriander fennel, ginger, basil, parsley and turmeric. Drink 2 to 3 litres of water every day. This is considered good in body’s purification process. While allergy is human body’s natural reaction to an external irritant, excessive and annoying allergic reactions during spring months can be controlled by a combination of ayurvedic herbs, ayurvedic diet and in extreme cases an ayurvedic treatment and an ayurvedic detox. Ayurvedic treatments can also provide human body with long term immunity. So, this spring, get out there and take that deep breath of fresh air without worrying about Hay fever. Allow Ayurveda’s simple and holistic natural ways take care of what ails you! Ayurwoman and our practitioner Jyothi have exactly what you need to live free of allergies. Contact our clinic via email or Phone or by using our contact form and we will definitely get in touch with you.